It’s easy to believe that content marketing stops with your marketing department. (I mean, "marketing" is right there in the name.) 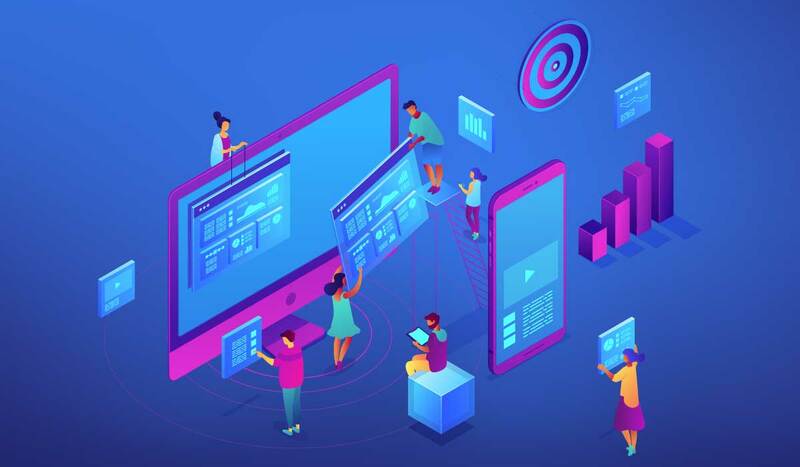 However, there are a ton of ways that content can make an impact beyond the marketing department, and one area it can have a huge effect on is sales enablement. When you arm the members of your sales team with content that educates prospects, answers questions, and breaks down barriers, you enable them to supplement their sales conversations, improve efficiency, and spend more time selling. What Does Sales Enablement Content Look Like? 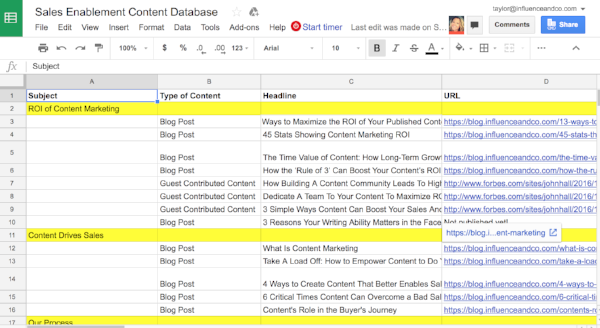 That kind of content is called sales enablement content, and it can take several different forms: articles on your blog, guest posts in outside publications, whitepapers, case studies, infographics, webinars, email drip campaigns, and more. What's more important than its format, though, is what it actually says. That's because sales enablement content isn't any one kind of content — it's simply content that enables your sales team to do their jobs better and more efficiently. Educates prospects about your company, your processes, ROI, etc. To create content that helps your sales team do these things, you’ve got to include them in the process. Now, for any content creator or marketing leader not currently working closely with sales, even figuring out where to start can be challenging. I’m fortunate that our sales and marketing teams at Influence & Co. have a productive relationship. We're frequently in communication about our sales process, and we've also implemented procedures that have aligned our teams and made working together easier. 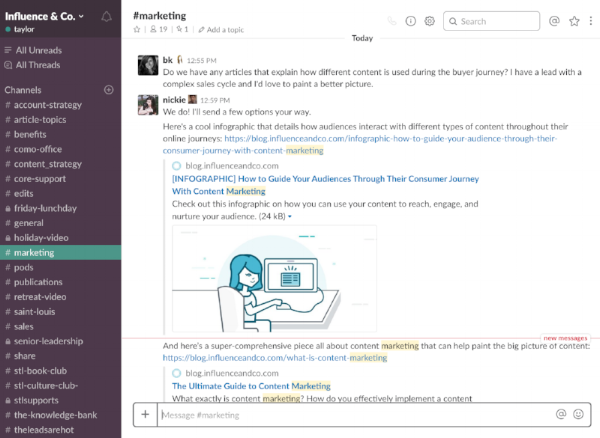 We use Slack for our internal communication at Influence & Co., and each department has its own channel. We make it a point to invite relevant members of our marketing and sales teams to each department’s Slack channels. Having a central place to reach each other makes it easy for our two departments to stay in the know and quickly answer questions. This could get distracting depending on how you employ this chat feature, but using these channels to discuss information that's relevant to the entire department keeps notifications to a minimum. For example, it's not uncommon for members of our sales team to hop onto the marketing channel to ask for a piece of content about a specific topic. This helps us quickly know what they're looking for. If we have an article that works, we send it along through Slack, and if we don’t, we add it to our list of future content ideas. And over on the sales channel, the team often has group conversations about tricky questions from prospects they're trying to answer. Because our marketing team also has access to those conversations, we can either chime in or file ideas away for content to develop in the future. “We should write an article on ... ” is a phrase our marketing team hears all the time. To help us keep all these ideas organized, we use Typeform to power a simple form that allows members of our team to submit content ideas whenever they're feeling inspired. In addition to requesting an article summary, we ask questions like “Would you like to be the author of this piece?” and “Why is this a valuable topic for us to cover?” so we can ensure we're getting all the information we need to create a great piece of content that moves our strategy forward. Getting sales and marketing into the same room is essential. Generally, our teams come together on a quarterly basis for a brainstorm and to talk through prospects, the sales process, and future articles. If both teams prep ahead of time, everyone can show up with specific questions to make the most of their time together. Better yet, a moderator can be appointed to collect questions beforehand and direct the group conversation to elicit the best insights. What questions are you getting that take a lot of time to answer? What's the most common reason prospects are giving you for not moving forward? What’s the most common question you get from people during the sales process? What’s a piece of content you wish you could send that you don’t have? What’s the No. 1 piece of content you always send? What are some ways you’ve described our services or products on a sales call that have gone over really well? Not all of these prompts are directly content-specific, but each can help your sales reps talk through their experiences, problems, and wins in a way that uncovers valuable sales enablement content ideas. One simple, effective way for your marketing team members to learn more about what's going on in the sales team is to invite them to shadow sales calls. Our team is encouraged to listen in on sales calls whenever we like — in fact, we've made sales shadowing a regular part of our training process. Sitting in on calls is a great way to immerse yourself in the sales process and learn first-hand what your sales reps need — and it requires very little extra time and effort from your sales team. When it comes to actually creating content using all these new insights, I recommend letting your marketing team take the lead. They're likely faster and better content creators than your sales reps, and they can ensure this new content remains consistent with all your other work. 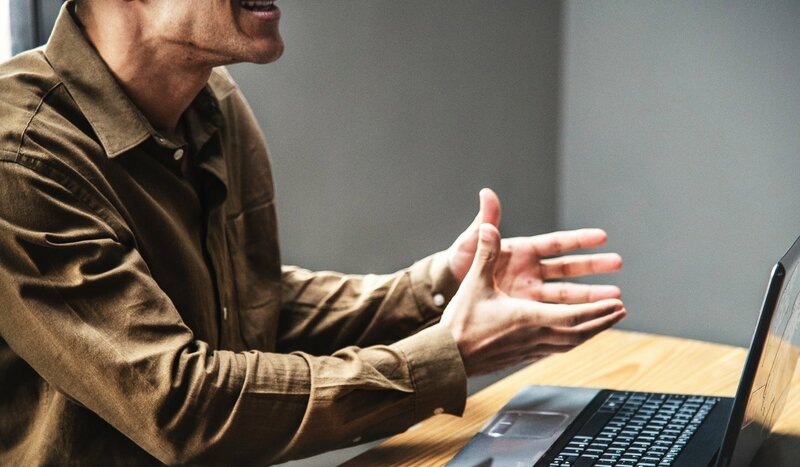 However, your sales team members are the ones having these conversations every day, and they can provide lots of helpful, specific expertise and feedback on content. To collect that detailed information, use a knowledge extraction process. Knowledge extraction makes it easy to create content by helping you gather the most important, relevant information from your team members as quickly as possible. Ask your sales team a series of questions about your topic and use their unique answers and expertise to create content that specifically addresses their needs. Store and organize your team's expert insights using a knowledge bank. Download your customizable to get started. This way, marketing gets the insights it needs to create great content, and sales gets the content it needs for better conversations. It's a win-win. You already know that just creating content doesn't do much good if no one sees it, and the same applies to your sales team members. Once your marketing team has finished creating awesome content for your sales team, it’s important to make it really easy for sales to access it. 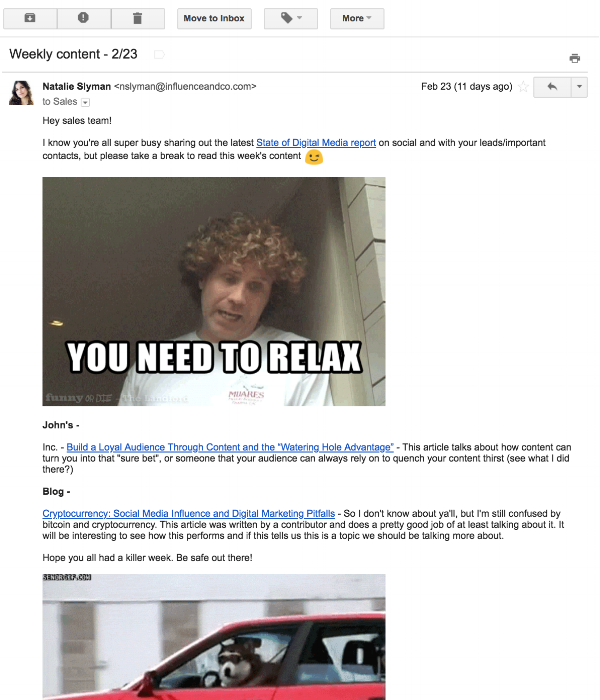 Our director of content and social media sends an email to our sales team every Friday with a list of all of the relevant content we published that week, along with a quick blurb about how it can be used during sales conversations. We've also used Zapier to integrate our blog’s RSS feed with Slack to push a notification to a specific channel each time a post is published on our blog. 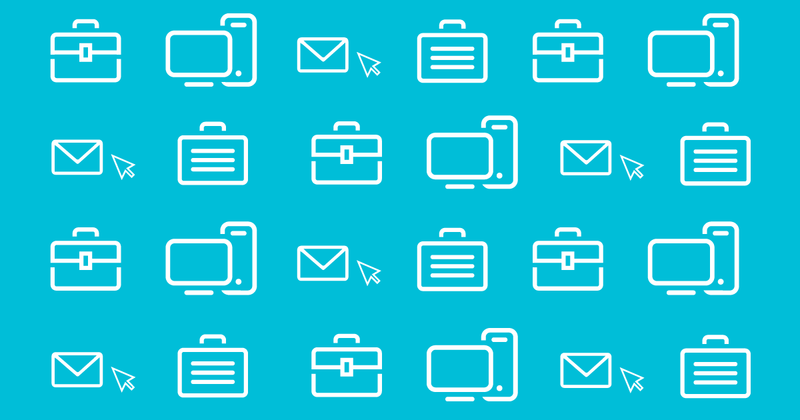 There are lots of Zapier hacks you can use to save your marketing team time, and this one is a great example: It's a quick and easy way for our whole team to get the lowdown on the latest pieces of content we've published. Finally, keep all your best sales enablement content in one easy-to-access place. Our VP of sales manages a resource bank for our sales team. 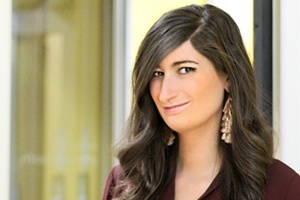 She receives those weekly emails I mentioned above and filters through everything to store the best-of-the-best content in a resource library for the sales team to use. This library doesn’t need to be anything fancy — a simple Google Sheet with a list of common objections in one column and a link to the corresponding piece of content that addresses them in the next is all you need. Content marketing is a powerful tool to fuel your sales process. The key to using that tool effectively is sales and marketing alignment. 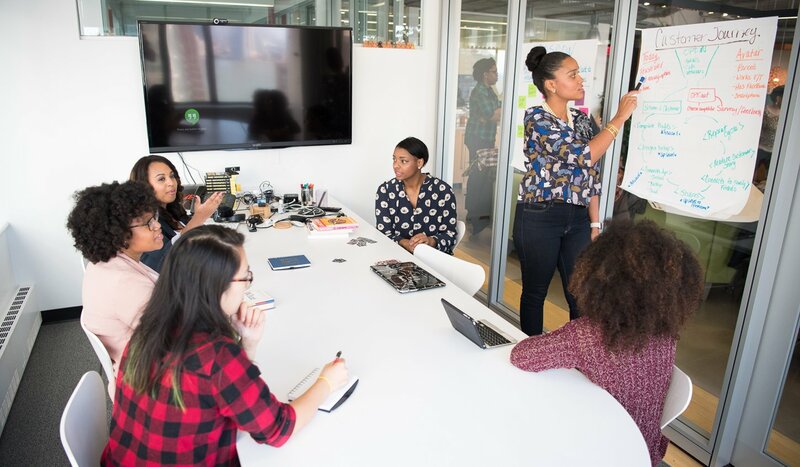 Using these seven tactics, you can bring your teams together, allowing your marketing team to better create high-quality content specifically for sales's needs and your sales team to spend less time finding content and more time selling.